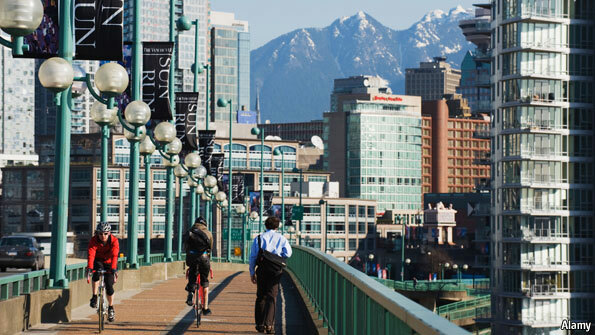 VANCOUVER remains the most liveable city in the world, according to the latest annual ranking compiled by the Economist Intelligence Unit. The Canadian city scored 98 out of a maximum 100, as it has done for the past two years. The ranking scores 140 cities from 0-100 on 30 factors spread across five areas: stability, health care, culture and environment, education, and infrastructure. These numbers are then weighted and combined to produce an overall figure. The top ten cities occupy the same positions as last year, with the exception of Melbourne and Vienna, which have swapped places. Cities that score best tend to be mid-sized cities in wealthier countries with a relatively low population density. This often fosters a broad range of recreational availability without leading to high crime levels or overburdened infrastructure. Seven of the top ten scoring cities are in Australia and Canada, where population densities of 2.88 and 3.40 people per sq km respectively compare with a global (land) average of 45.65 and a US average of 32. At the other end of the ranking, Harare, the capital of Zimbabwe, is in 140th place, thanks to particularly poor scores for its stability, health care and infrastructure. Somewhere between the extremes sit London and New York in 53rd and 56th places. They are let down by stability scores of 75 and 70, the result in turn of poor scores for the perceived threat of terror and the rates of petty and violent crime.